Objectives: Recurrent hepatitis C infection leads to accelerated graft loss in liver transplant recipients. Telaprevir offers a higher chance of cure in these patients. We sought to assess the effectiveness of telaprevir in treatment of hepatitis C in liver transplant recipients. Materials and Methods: We report a series of 17 patients who received telaprevir for recurrent hepatitis C virus infection. These patients were previous treatment failures including 10 null responders. All patients received pegylated interferon alpha 2a (180 μg/wk) and ribavirin (800 mg/d) for 1 year and telaprevir 750 mg every 8 hours for 12 weeks. The immunosuppressive regimen was not changed during therapy, but the dosages were modified based on serum levels of the drugs. Results: In an intention-to-treat analysis, the overall sustained virologic response 12 was 58%, with a relapse rate of 24%. Nine patients (52%) achieved extended rapid virologic response. Seven patients (77%) with extended rapid virologic response achieved sustained virologic response 12. Four patients (40%), who were previous null responders to interferon and ribavirin also achieved sustained virologic response 12. Anemia and ribavirin dosage reduction were common. Severe thrombocytopenia was seen in 2 patients resulting in discontinuation of therapy. A tacrolimus-based immunosuppressive regimen could be continued with close monitoring. During the initial 4 weeks of therapy, there were wide fluctuations in tacrolimus levels. However, after 4 weeks, tacrolimus could be dosed weekly maintaining a trough level of 3 to 10 ng/mL. Conclusions: Telaprevir can be used effectively in liver transplant recipients receiving tacrolimus-based immunosuppression. Sustained virologic response 12 can be achieved in a significant number of these “difficult-to-treat” patients. Pegylated interferon (PEG IFN) combined with ribavirin has been used to treat recurrent HCV after liver transplant. Several small studies have reported an SVR rate between 25% to 35%.7-9 Telaprevir is a potent NS3 protease inhibitor that was approved in 2011 to treat chronic HCV. The addition of telaprevir to PEG IFN/ribavirin regimen results in 30% to 35% improvement in SVR over the standard regimen in nontransplant patients.10,11 Given its higher effectiveness, adding telaprevir can significantly increase the SVR in recurrent HCV in posttransplant patients. The major concern in using telaprevir in liver transplant recipients is its interaction with immunosuppressive agents.12,13 All the immuno-suppressive drugs used in these patients are metabolized by the CYP3A pathway, and telaprevir increases levels of all these drugs. For example, telaprevir has been shown to increase tacrolimus level 70 times.14 However, drug levels of these immuno-suppressive agents are readily available and hence, it is feasible to use them in closely monitored situations. We report a series of posttransplant patients who underwent treatment with telaprevir for posttransplant HCV. We report a sustained virologic response at 12 weeks (SVR12) in 17 patients treated with telaprevir after liver transplant. Table 1 shows the clinical characteristics of the patients. These patients had failed treatment with pegylated interferon and ribavirin (10 null responders, 4 partial responders and 3 relapses) either before or after liver transplant. Seven patients had advanced fibrosis (stages 3 and 4). Two patients (Nos. 11 and 13) had stage 0 fibrosis. Patient No. 11 had previous graft loss because of HCV and hence treatment was initiated early. Patient No. 13 had membrano-proliferative glomerulonephritis (normal glomerular filtration rate) associated with HCV. Twelve patients were taking tacrolimus, 2 patients were taking cyclosporine, and 3 were taking sirolimus. All patients had recovered from liver transplant and had no ongoing complications. They also were on stable immunosuppressive medications at the time of treatment. Two patients had liver-kidney transplant. We used a standard regimen of pegylated interferon alpha 2a (180 μg/wk) along with ribavirin (800 mg/d). The duration of PEG IFN and ribavirin (P/R) was 48 weeks. Telaprevir was given in standard doses at 750 mg every 8 hours for 12 weeks. A lower dose of ribavirin was used when there was a high incidence of anemia in posttransplant patients. Both erythropoietin and filgrastim were used to treat low hemoglobin and low neutrophil count. Erythro-poietin was used at 40 000 U/week for hemoglobin of < 100 g/L. Ribavirin dose was reduced to 400 mg/day when the hemoglobin was < 80 g/L. Filgrastim was used when absolute neutrophil count was < 500/mm3. A “lead in ” with PEG IFN and ribavirin was used in patients with baseline cytopenia and/or previous history of cytopenia or depression with standard regimen. The duration of lead in varied from 4 to 8 weeks based on the tolerability, availability, and response to growth factors. Telaprevir was started only once a stable regimen of PEG IFN and ribavirin could be established. If a lead in phase was used, the immunosuppression was not changed. The dosing frequency of the immunosuppressive drug was changed at the initiation of telaprevir. The tacrolimus dose was modified as follows (Figure 1). The patient took half of his/her daily dosage on day 1 of telaprevir. The tacrolimus level was checked on days 3 and 7 along with liver enzymes and complete blood counts. 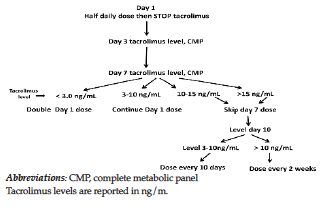 Tacrolimus was dosed weekly, at half the standard daily dose, if day 7 level was between 3 and 10 ng/mL. Our target level was between 3 and 10 ng/mL while taking telaprevir and < 3 to 5 ng/mL after ceasing telaprevir. In patients taking sirolimus, the daily dosage was given once per week. For patients taking cyclosporine, the dosage was reduced to one fourth of the daily dosage and was given once per day. Among the 17 patients, 8 patients had a lead in phase with PEG IFN and ribavirin. Fourteen patients competed 12 weeks of telaprevir and 2 patients had to stop treatment owing to severe thrombocytopenia. One patient (No. 4) stopped all drugs by herself at week 6 of telaprevir. However, she achieved SVR at 24 week follow-up after discontinuing treatment. One patient stopped treatment telaprevir at week 8 (No. 13) but continued PEG IFN and ribavirin. One patient stopped PEG IFN therapy at 6 months owing to unexplained tachycardia. One patient (No. 12) met the futility rule at week 12 and treatment was discontinued. Table 2 shows the virologic response to treatment at various times during treatment. In an intention-to-treat analysis, the overall SVR 12 was 58% with a relapse date of 24% (Figure 2). All relapses occurred within first 4 weeks. Nine patients (52%) achieved undetectable RNA at week 4 (Figure 2). Two patients (Nos. 4 and 13) who were undetectable at week 4 did not complete 12 weeks of telaprevir, but they remained undetectable at week 12, so in effect, 9 patients (52%) were extended rapid virologic response. 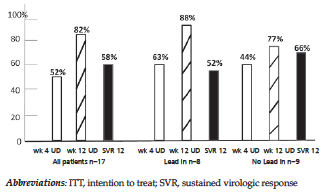 Seven patients (77%) with extended rapid virologic response achieved SVR 12. Four patients (40%) who were previous null responders to interferon and ribavirin also achieved SVR 12. Only 1 patient, who was a previous null responder, met the futility rule. Eight patients had lead in therapy with pegylated interferon and ribavirin, 5 patients (63%) were undetectable at week 4, and 7 patients were 88% undetectable at week 12. One patient (No. 12) met the futility rule. Interferon responsiveness with > 1 log decline in HCV RNA levels, during the lead in phase seemed to improve early virologic response with telaprevir. Only 4 patients (44%) with no lead in had undetectable RNA levels at week 4. However the SVR 12 was not different between patients who received lead in and those who did not received lead in (P > .05). Table 3 highlights the dosage schedule and adverse events. The algorithm (Figure 1) served as a template for monitoring drug levels and adjusting the dosage interval. During the initial 4 weeks of treatment, tacrolimus levels fluctuated widely, and drug levels > 15 ng/mL were seen in 3 patients within the first 2 weeks of initiation of telaprevir. Because of the wide fluctuation in tacrolimus levels, most patients required twice weekly drug level measurements during first 2 to 4 weeks. However, toward the end of 4 weeks, we could arrive at a steady maintenance dose with target trough level before the subsequent dose of around 3 to 10 ng/mL. Among the 12 patients on tacrolimus, 9 were maintained on 0.5 mg/week after the initial 2 to 4 weeks. Two patients were maintained on 1 mg/week. One patient was maintained on 0.5 mg every 2 weeks. No patient required a dosing interval of less than once a week. A mild increase in serum creatinine was noted in the 3 patients who had a tacrolimus levels more than 15 ng/mL. The maximum serum creatinine observed was 159.2 mmol/L. Our immunosuppression protocol generally keeps tacrolimus level at the low end of therapeutic range around 3 ng/mL even when patient was getting antiviral therapy. In our experience, this approach had no adverse consequences and helped avoid other immunosuppressive complications. Few of our patients had low levels of tacrolimus while receiving the once a week dose, and we did not see episodes of rejection. 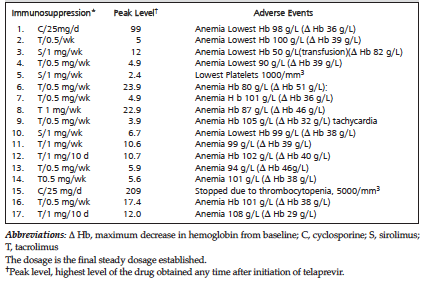 All patients (100%) who completed more than 4 weeks of telaprevir developed anemia. Severe anemia with hemoglobin level < 80 g/L was seen in 3 patients. Two of these patients (Nos. 3 and 5) had to get blood transfusions despite the use of erythropoietin and dose reduction in ribavirin. Patient No. 3 continued telaprevir and completed 1 year of treatment. One patient received platelets and red blood cell transfusions (No. 5) and discontinued treatment. Seven patients developed moderate anemia (hemoglobin levels between 80 and 100 gm/L and required a dosage reduction in ribavirin to 400 mg/week and use of erythropoietin. The remaining 4 patients had mild anemia (hemoglobin between 100-120 g/L), and 2 received erythropoietin owing to symptoms of severe fatigue. One patient developed unexplained tachycardia at 6 months of his treatment, and the interferon and ribavirin were stopped at 6 months. The cause of tachycardia is not known, but it resolved after treatment was discontinued. The ribavirin dosage was reduced to 400 mg/day in 10 patients (58%). No patient could tolerate a dose more than 800 mg/day. Filgrastim was used in 1 patient. One patient with low glomerular filtration rate (< 40 mL/min) received 135 μg of pegylated interferon alpha 2a. Severe thrombocytopenia (platelet count < 10 000/mm3) was seen in 2 patients. In both of these patients, the platelet count improved to baseline within 4 weeks of discontinuation of treatment. Our data show that telaprevir can be used effectively in postliver transplant patients in a carefully monitored setting. Hematologic adverse effects seem to be a major issue in these patients. Severe anemia is common and much higher than what is reported in phase 3 trials of telaprevir. However, this is somewhat expected because of reduced renal function in many of these patients. Anemia was seen in most patients, despite lower starting dosages of ribavirin. Two patients in the study received simultaneous liver kidney transplants. These 2 patients did not have any increase in serum creatinine during treatment, and their calculated glomerular filtration rate remained unchanged. In simultaneous liver kidney recipients, the renal allograft is less susceptible to rejection and we believe interferon is less likely to precipitate rejection. We also did not observe any increase in infections in these patients while undergoing antiviral therapy. Only 2 patients required hospitalization for transfusion for anemia. We typically used an absolute neutrophil count of 500 as the cutoff for initiating antiviral therapy. Unlike chemotherapy-induced neutropenia, interferon-induced neutropenia is less likely to be associated with infections. In nontransplant patients receiving interferon, neutrophil counts have been shown to increase appropriately in response to infection. Our patients had strong indications for eradicating HCV to preserve their allograft, and we believe neutropenia could be managed effectively with filgrastim and/or a dosage reduction of peg interferon. We decided to use telaprevir over boceprevir primarily because of the short duration of telaprevir regimens. The shorter duration of telaprevir (12 weeks) was considered a major advantage, as this required fewer laboratory tests and clinic visits during treatment. In addition, several patients were null responders to previous pegylated interferon and ribavirin treatment and boceprevir phase 3 clinical trials did not include null responders. The decision to use a lead in phase was based on several factors. Because anemia is a well-known complication of antiviral therapy in liver transplant recipients, we wanted to stabilize the dosages of the standard regimen before we introduced telaprevir. The lead in also helped us to get approval of erythropoietin before the introduction of telaprevir. Lead in was not used in patients who did not have any serious hematologic adverse events (defined as hemoglobin < 100 g/L, neutrophil count of less than 500 /mm3) during previous treatment. Having a lead in phase did not improve SVR, albeit the number of patients is too small to address the benefit of lead in regarding SVR. Interestingly, 40% of patients who were null responders to previous interferon regimen achieved SVR. This is higher than the SVR rate reported in the registration trials. In conclusion, telaprevir can be used effectively in liver transplant recipients receiving tacrolimus-based immunosuppression. Significant number of these “difficult-to-treat” patients achieve SVR. Berenguer M, Ferrell L, Watson J, et al. 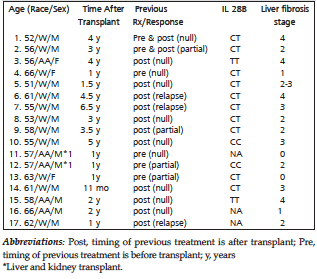 HCV-related fibrosis progression following liver transplantation: increase in recent years. J Hepatol. 2000;32(4):673-684. Forman LM, Lewis JD, Berlin JA, Feldman HI, Lucey MR. The association between hepatitis C infection and survival after orthotopic liver transplantation. Gastroenterology. 2002;122(4):889-896. Organ procurement and transplant network and scientific registry of transplant recipients OPTN/SRTR 2010 annual data report United States Organ Transplantation. Liver. 2011:53-74. Bizollon T, Ahmed SN, Radenne S, et al. Long term histological improvement and clearance of intrahepatic hepatitis C virus RNA following sustained response to interferon-ribavirin combination therapy in liver transplanted patients with hepatitis C virus recurrence. Gut. 2003;52(2):283-287. Abdelmalek MF, Firpi RJ, Soldevila-Pico C, et al. Sustained viral response to interferon and ribavirin in liver transplant recipients with recurrent hepatitis C. Liver Transpl. 2004;10(2):199-207. Picciotto FP, Tritto G, Lanza AG, et al. Sustained virologic response 12 to antiviral therapy reduces mortality in HCV reinfection after liver transplantation. J Hepatol. 2007;46(3):459-465. Carrión JA, Navasa M, García-Retortillo M, et al. Efficacy of antiviral therapy on hepatitis C recurrence after liver transplantation: a randomized controlled study. Gastroenterology. 2007;132(5):1746-1756. Berenguer M. Systematic review of the treatment of established recurrent hepatitis C with pegylated interferon in combination with ribavirin. J Hepatol. 2008;49(2):274-287. Crespo G, Mariño Z, Navasa M, Forns X. Viral hepatitis in liver transplantation. Gastroenterology. 2012;142(6):1373-1383.e1. doi: 10.1053/j.gastro.2012.02.011. Zeuzem S, Andreone P, Pol S, et al. Telaprevir for retreatment of HCV infection. N Engl J Med. 2011;364(25):2417-2428. Garg V, van Heeswijk R, Lee JE, Alves K, Nadkarni P, Luo X. Effect of telaprevir on the pharmacokinetics of cyclosporine and tacrolimus. Hepatology. 2011;54(1):20-27. Wilby KJ, Greanya ED, Ford JA, Yoshida EM, Partovi N. A review of drug interactions with boceprevir and telaprevir: implications for HIV and transplant patients. Ann Hepatol. 2012;11(2):179-185. Bacon BR, Gordon SC, Lawitz E, et al. Boceprevir for previously treated chronic HCV genotype 1 infection. N Engl J Med. 2011;364(13):1207-1217. Mantry PS, Wu C, Weinstein JS, et al. Early and end of treatment Virologic Response in patients with Hepatitis C genotype 1. Recurrence after Liver Transplant treated with triple therapy using Telaprevir: A Single Center Experience. Hepatology. 2012;56(suppl 4) Abstract No. 12;533. Burton JR, O’Leary JG, Verna EC, et al A multicenter Study of Protease inhibitor-Triple Therapy in HCV infected Liver Transplant Recipients. Report From the CRUSH C group A Single Center Experience. Hepatology. 2012; 56(suppl 4) Abstract No. 211;297. Acknowledgements: The authors declare that they have no conflicts of interest, and there was no funding for this study. This manuscript was presented at the AALSD annual meeting in Boston, November 9-13, 2012.